Being one of the biggest music acts around, it is tough for U2 to make an arena show intimate. 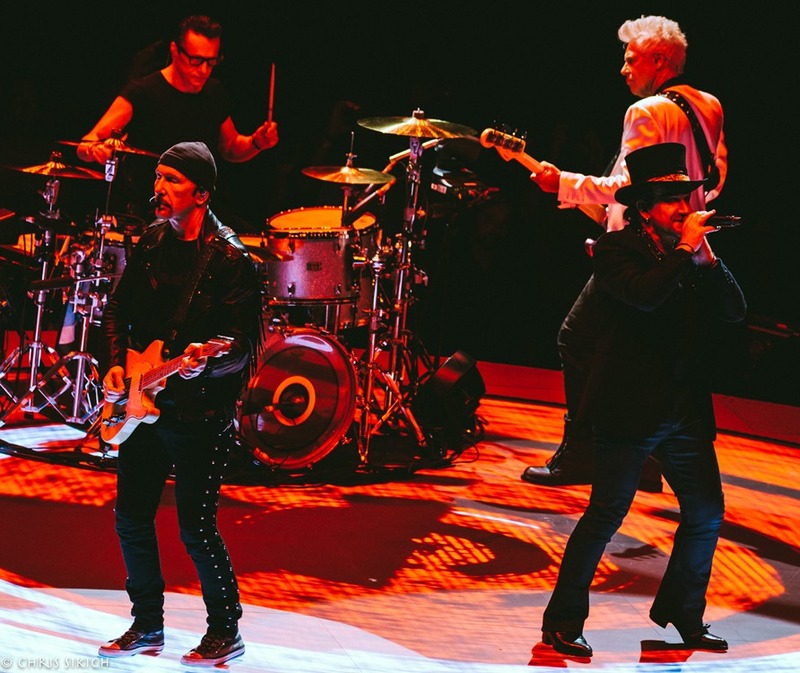 During their first of two nights at Wells Fargo Center on Wednesday, Bono, The Edge, Adam Clayton and Larry Mullen Jr. wanted to strip away the grandiose to reveal inner truths about their art, themselves and the world around them. It was a fascinating high wire act that was often successful. The show opened with a stunning rendition of “Love is All We Have Left” from their most recent album, Songs of Experience. Bono was revealed to be within the video board in the middle of arena, asserting his frequent declarations of the power of love alone. The rest of the band emerges from within the screen; U2 can be nothing without all its parts. Bono still walks alone; the lights of cell phones illuminating the sold out South Philly venue. There was the political, something Bono and company like to discuss, if only from afar. Declaring there is “no them, only us,” visuals of the infamous Charlottesville march by white supremacists a year ago filled the arena while Bono and The Edge did a beautiful acoustic rendition of “Staring at the Sun.” No comments were made about the images and the context of the song, which discusses those who fear what could be found when a deeper examination is done, is a powerful message to all in attendance. Then to bridge the present with the past of Martin Luther King, Jr., “Pride (In the Name of Love)” slaps the crowd even more. During a raucous “American Soul,” when a gigantic American flag provides the backdrop for much of Wells Fargo Center, Bono says he loves America. Can a band cause its fans to be introspective and actually stand up for what’s right? U2 has never lost hope that they can do just that. The profundity of the show could have reached greater heights. The video board was not used enough. During the 2015 tour, the images lit up Madison Square Garden throughout the show. In Philly on Wednesday, there was a lot of darkness and blank space. And the sound, which is often good at Wells Fargo, was off and did not amplify Bono’s speaking voice well or bring out all the nuances in the music. The encore opener of “One” was as stirring as ever. The final song, “13 (There is a Light)” was dedicated to U2’s former manager who died in 2015. A seemingly odd finale, it blossomed into a great end. Bono separated from the band and walked the catwalk to the secondary stage. An oversized light bulb was swung by Bono into the crowd and then the leader of U2 disappeared into the crowd. Experience can be a solitary state, one of reflection and growth. The show reflected many aspects of this. One thing is for certain, wherever U2 go, the music world will follow, listening for the hints of the older brilliance and new perspectives. Copyright ©2018 PopEntertainment.com. All rights reserved. Posted: June 16, 2018. Tags: 13 (There is a Light), 2018, Achtung Baby, Acrobat, Adam Clayton, America, American Soul, Beautiful Day, bono, Charlottesville march, Chris Sikich, Concert Photo Album, Concert Photography, Concert Photos, concert review, I Will Follow, June 13, Larry Mullen Jr., Love is All We Have Left, Martin Luther King, One, PA, philadelphia, PopEntertainment.com, Pride (In the Name of Love), Songs of Experience, South Philly, Staring at the Sun, The Edge, U2, Wells Fargo Center, You're the Best Thing About Me. Bookmark the permalink.